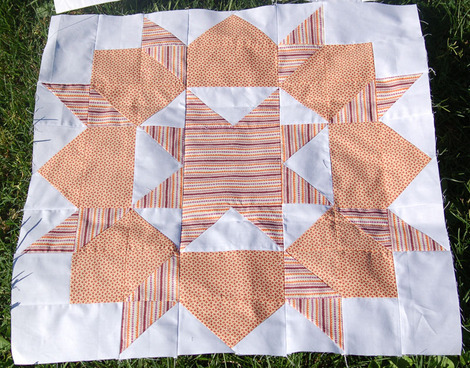 The end is in sight and I continue to be sure about my decision for four Swoon block instead of nine. ;) I do love how they are looking together though! The pictures aren't the best. I finished the block this weekend and all day Sunday was raining and dark. Yesterday was the start of a new week which means I get home around 4pm with two kids who want to play, snack, need baths, etc. So these will have to do! Lookiing good! I wish we had a sit and sew this week! Going anywhere for spring break? Im doing a sew/staycation! Very "springy" colors --- they are pretty! Have a good spring break. 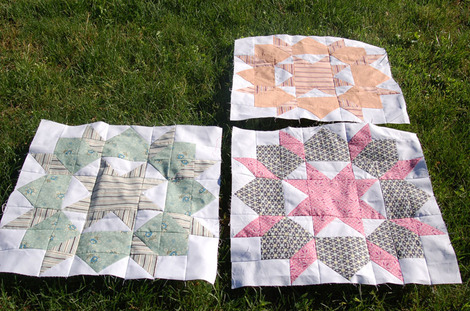 A friend of mine was looking for someone to make some fairly simple quilts for her. I suggested she cruise Etsy, but then I thought of you. Any interest? PS Love the latest pix! This page contains a single entry from the blog posted on March 27, 2012 9:03 PM. The previous post in this blog was I'm Sailing! is finished. The next post in this blog is Test Petal.